What does it mean to give church a try when you haven’t really tried since you were twelve? At the end of her bestselling memoir Mennonite in a Little Black Dress: A Memoir of Going Home , Rhoda Janzen had reconnected with her family and her roots, though her future felt uncertain. But when she starts dating a churchgoer, this skeptic begins a surprising journey to faith and love. 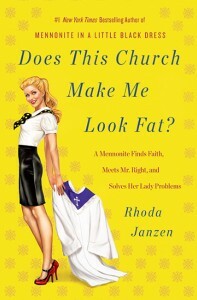 Rhoda doesn’t slide back into the dignified simplicity of the Mennonite church. Instead she finds herself hanging with the Pentecostals, who really know how to get down with sparkler pom-poms. Amid the hand waving and hallelujahs Rhoda finds a faith richly practical for life–just in time for some impressive lady problems, an unexpected romance, and a quirky new family. Does This Church Make Me Look Fat? is for people who have a problem with organized religion, but can’t quite dismiss the notion of God, and for those who secretly sing hymns in their cars, but prefer a nice mimosa brunch to church. This is the story of what it means to find joy in love, comfort in prayer, and–incredibly, surprisingly–faith in a big-hearted God. I couldn’t help but fall in love with this book. Rhoda Janzen’s irreverent writing style, although shockingly, sometimes hysterically funny, is also touchingly insightful. I had to pause frequently throughout my reading to find someone who would listen to particularly intriguing passages. I am thrilled to be able to share some of these with my readers as well. As far as I could see, there were two ways to read this situation. Either all that prayer mattered, or it didn’t. And I needed to make up my mind. As Rhoda’s medical situation worsens, she turns to God for help. During the process, she tries to learn an “attitude of gratitude” – a new endeavor for her. Like most people when they first approach God, all I wanted was help. I was hoping God might swoop in and do the work fo rme. He didn’t do that. But he did show me how to do the work myself. One day something clicked into focus…(I had) the tardy epiphany that I had spent a lifetime blaming other people for my own stuff. The sheer force of this revelation took my breath away. It changed everything. All of a sudden I saw that holding a grudge was a way to avoid confronting my own stuff. Rhoda looks to her parents as an example of godly living. A Mennonite minister and his wife, they had “resolutely taken responsibility for their own happiness.” Her father-in-law, on the other hand, had allowed life to beat him down. He didn’t seem to find pleasure in anything. I tried to tell myself that the spirit of kvetch was understandable, given the onus of Albert’s disability. But in my heart I knew that nobody has to be crankypants. Kvetching is a choice. You can choose to do it, or you can choose not to. For me, the takeaway is that we don’t need to be strong and faithful and firm in order to approach God. We can be an unholy mess, like the son, or a frustrated skeptic, like the dad. What a relief that we don’t have to be good at religion in order to seek God! We don’t even have to have a strong sense of belief. All we need is the desire to believe. I decided to approach marriage as the dad approaches Jesus. Don’t expect a typical religious memoir. There are a few mild swear words throughout this book and it is anything but pious. But Rhoda’s journey toward a deeper relationship with God and her fiancee’ is a story that many of us can relate to. I too, feel a strong relationship with God, but often struggle with some of the teachings of the church. I really appreciated how Rhoda dealt with this conflict and deepened her faith in the process. My only problem with the book was the occasional overuse of “large” words. Really, how many times should the word ineluctable be used in one book? I had to pull out the dictionary frequently throughout my reading, which as my friends know, is highly unusual for me. However, not knowing these words will not detract from the story itself, so don’t let this keep you away. I’m just a little obsessive that way. I give Does This Church Make Me Look Fat? : A Mennonite Finds Faith, Meets Mr. Right, and Solves Her Lady Problems 4 1/2 sparkly pompoms!! A must read!! I received a complimentary copy of this book for the purposes of review. All opinions are 100% my own. Rhoda Janzen is the author of the #1 New York Times bestselling Mennonite in a Little Black Dress and the poetry collection Babel’s Stair . She holds a Ph.D. from UCLA and teaches English and creative writing at Hope College in Holland, Michigan.